The U.S. Secretary of State says Assad could avoid a strike if he gave up his entire chemical weapons arsenal within a week. US Secretary of State John Kerry has told a press conference in London that Syrian President Bashar al-Assad could avoid a strike on his country by giving up "every single bit" of chemical weapons arsenal to the international community within a week. Kerry made the remark in answer to a question posed by journalist at a joint press conference with the British Foreign Minister William Hague. The Secretary of State has been visiting allies in Europe mustering support for a military strike on Syria following what he says is clear proof that Assad ordered the fatal attack in Damascus on August 21 which the U.S. says killed 1400 civilians among them hundreds of children. "We know that his regime gave orders to prepare for a chemical attack. We know they deployed forces," Kerry said. In his comments, Kerry also shrugged off an idea that Assad could help negotiate a peaceful resolution to his country's problems,. "If he (Assad) believes he can use chemicals that have been banned for nearly 100 years with impunity, he will never come to a negotiating table." Meanwhile Syria's Assad has denied there is any evidence that his regime used chemical weapons and suggested that if attacked its own allies would respond with force of their own. As US President Barack Obama attempts to rally support in Congress for a strike on Syria, Secretary of State John Kerry is waging a diplomatic offensive with the same objective in Europe. 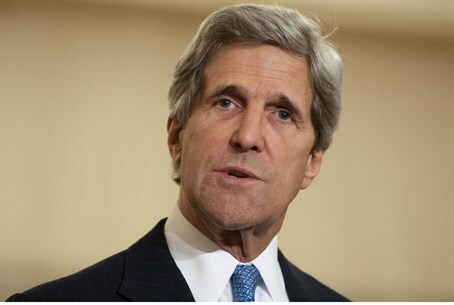 Kerry held talks with Arab League ministers in Paris on Sunday, in which Syria was the main topic. Kerry said afterward that the sides had agreed that Bashar al-Assad's regime had crossed a "global red line" with the August 21 chemical weapons attack that killed hundreds. Participants in the talks included officials from the Arab League, and nine Arab countries.